Brad Keselowski #2 Discount Tire Ford Mustang-Same scheme as last year, same A grade. Kevin Harvick #4 Busch Beer Car 2 Can Ford Mustang-The black carbon fiber looks great, and the car isn’t over designed. It’s a great look, and this scheme earns an A.
Ryan Newman #6 Wyndham Rewards Ford Mustang-Removing the clouds would work if they hadn’t added the stripes. This could have been so much better, but the over designed stripes take it from an A to a B+. Ryan Newman #6 Performance Plus Motor Oil Ford Mustang-Same scheme as last year, same B- grade. Chase Elliott #9 Mountain Dew/Team Rubicon Chevy Camaro-Camo doesn’t add to many schemes, but this scheme is so much worse. Metallic gold and camo is not a good look. The rest of the scheme is good, but the camo takes an A scheme down to a B+. Aric Almirola #10 Smithfield Prime Fresh Ford Mustang-Another example of two different design elements which would be amazing by themselves, but look forced and awkward together. The white would work, the green would work, they don’t work well together. Still, it isn’t horrible, so I’ll give it a B+. Clint Bowyer #14 Mobil 1 Ford Fusion-The black with subtle red flames is an amazingly bold look, that isn’t over designed. It looks great and earns an A.
Ricky Stenhouse Jr. #17 Little Hug Fruit Barrels Ford Mustang-Same scheme as last year, same F grade. Erik Jones #20 SportClips Toyota Camry-The smartphone motif is decent, because it covers the stripes. It’s still not a great scheme, but it is an improvement, so I’ll give it a C.
Joey Logano #22 Shell/Pennzoil Ford Mustang-Same scheme as last year, same D grade. Michael McDowell #34 Love’s Truck Stops Ford Mustang-Same scheme as last year, same A grade. Matt Tifft #36 Speedco Ford Mustang-Same scheme as last year, same A grade. David Ragan #38 Select Blinds Ford Mustang-Decent color scheme, could be darkened a bit. Decent design scheme, could be toned down a bit. 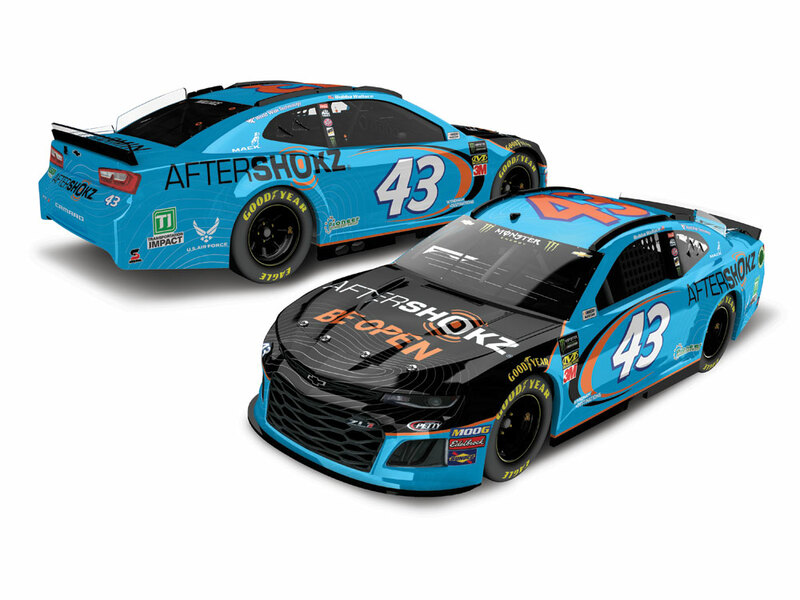 Together, they are a decent look combined, so I’ll give it a B.
Darrell Wallace Jr. #43 Aftershokz Chevy Camaro-Its a bold look, the color scheme is great, and the look isn’t over designed, so I’l give it an A.
BJ McCleod #51 Jacob Companies Chevy Camaro-Great color scheme, but the design scheme is over designed, but not too over designed. All things considered, I’ll give it a B.
Cody Ware #52 Winn-Dixie Chevy Camaro-Same scheme as last year, same A grade.